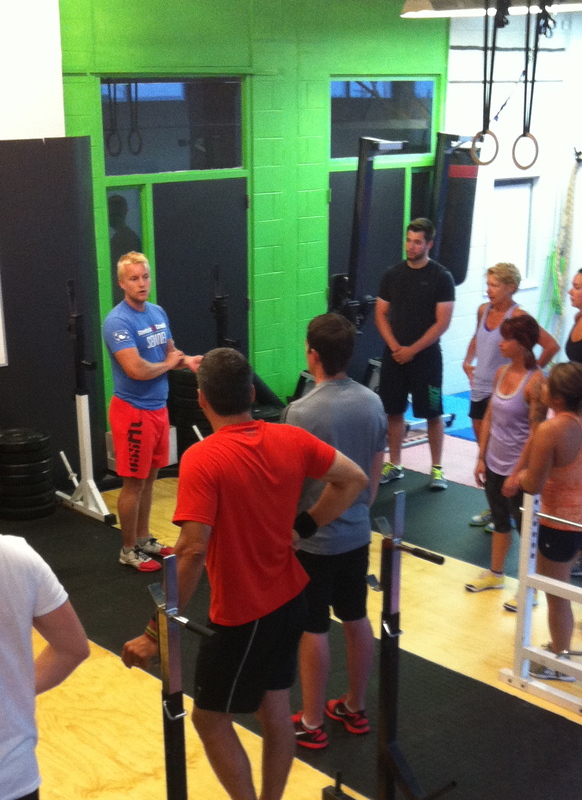 We are very pleased to introduce Brett Roberts as one of the full-time coaches at CrossFit 782. Some of you may have met Brett when he did some training at CrossFit PEI. He received his Bachelor of Science degree in Kinesiology from St. F.X. University and is currently taking his Bachelor of Education in Charlottetown after teaching full time for 4 years at Reebok CrossFit Sentinel in Seoul, Korea. Brett is originally from PEI and recently just returned from Seoul, South Korea where he created and was the director of Sentinel Youth, a program designed to teach kids about the advantages of fitness and nutrition. Brett was an avid athlete growing up, playing hockey, soccer, badminton, and ultimate frisbee competitively and still loves to get out on the field and compete. His love of sports evolved into a love of fitness as he trained at his uncle’s gym throughout high school and began his career in fitness at St. Francis Xavier University. Brett graduated with a Bachelor of Science degree in Kinesiology from St. F.X. University and upon completion Brett moved to Seoul to take up a position teaching children at a sports academy. After completing his contract there, he began coaching BootCamp classes for two years and then had the opportunity to work with Reebok and CrossFit where he honed his CrossFit coaching skills at CrossFit Sentinel for two years. His passion for all things fitness related and his natural ability for working with kids led him to create the Reebok CrossFit Sentinel Youth program, which has been in operation for the past two years. Since its inception, the program has been a huge success, and has given students aged 5 to 18 the chance to learn about fitness, nutrition, and living a healthy lifestyle. Brett completed his CrossFit Level 1 Certificate in May 2011 to build upon his Kinesiology degree and followed that up with his completion of the CrossFit Kids Certificate in April 2013. He had the chance to travel to NorCal CrossFit in San Jose for this certification and train under the eye of Pat Barber, Jason Khalipa, and Miranda Oldroyd. He completed his gymnastics certificate in October 2013 and had the privilege of training with the likes of Matt Chan, Austin Malleolo, James Hobart, Cherie Chan, and Adrian Bozman, all of whom had traveled to Seoul, South Korea to train and coach at CrossFit Sentinel, Brett’s former coaching grounds. As well in 2012 Brett competed in the Asian CrossFit Regionals as an individual and hopes to be part of a CrossFit 782 team in the near future. Brett is currently completing his Bachelor of Education degree at the University of Prince Edward Island and is looking forward to meeting you all at CrossFit 782 and helping you get healthier, happier, and ultimately fitter, each and everyday.